Perfect for the everyday operations of any restaurant, this mid-sized bus box is an effective and efficient way to transport goods from the table back to the kitchen. This versatile black bus tub measures 20" x 15" x 5" and boasts durable plastic construction built to carry even the heaviest of dinnerware. We purchased several of these functional black plastic bus tubs. These guys were basic, hard plastic. I've seen better quality, but I've also seen worse. They will work well for our purposes. A cheap and easy option for a bus tub. We are not too hard on things so I expect these to last a while. These bus tubs are really nice. We use these to put our fresh vegetables in when we cut them. They are a nice size, and they are really easy to clean. Great quality and good price! These are much more heavy duty and ridged than some of the other places. Some of the other ones I’ve bought in the past the bottom of the bin saga when it’s full. The ones I got from WebstaurantStore don’t do that. We use these bus tubs every day, multiple times a day, for countless numbers of things, ranging from food to supplies. Very durable, easy to clean. We have a winery with two kitchens and a commercial dishwasher in the front bar. I use this bin to carry dishes from the two kitchens to the dishwasher. It has held up great. A great size plastic bus tub that does a great job carrying glasses and dishes. Makes clearing tables quick and easy. A great style tub and easy to clean and store. Purchased these bins to use for thawing our blocks of fish from our freezer. They are very easy to handle and are also fairly heavy duty if used in a freezer or for storage. If you have a dine in location this bus tub is a must. They are large and very durable. They make great storage bins as well. These are a bit weaker than the 7" inch version but they compliment them so well. I love that the side does not tapered smaller from the top to the bottom by much. This makes it more like a box than a tub. These are really strong and durable boxes. We use them for transporting dirty plates and cutlery after meals for 50 students or so and after 5 years they're still robust. No broken handles so far. Pretty rugged bus tub. The size makes it easy to carry a full load in them. Besides use as a bus tub, we also utilize them to pack smaller items in them to transport to catering events safely. We use these bus tubs for something a little different than what they were designed for, turns out they are the perfect size for use in our greenhouse fodder racks!! We use lots of these tubs to sprout various feed seeds for our animals on farm. The durability and quality is perfect for turning 2 pounds of feed seed into 14 pounds of green healthy feed for our pigs every day!! Great Bus Tub, use it daily for dishes, cups, silverware. Helps with cleaning tables, makes it much easier for the bus boys. Very sturdy can hold up in commercial dishwashers for easy clean up. They hold up well, the sides have not cracked. Great purchase. There are heavier bus tubs and deeper bus tubs out there, but this one is of totally acceptable quality and serves my needs perfectly. Plus, you can't beat the price. I really this this plastic bus tub. I dont use it to bus in the traditional sense, but I use it to store items and to transport and store food items for a short time. It has worked well for me. This is a great bus tub. It's super thick plastic, so it's durable and easy to keep clean. We paired it with the Choice 32" x 16" x 38" Black 3 Shelf Utility / Bus Cart and couldn't be happier. These are the perfect size tubs to fit under my bar machines:warewasher and refrigerator. They are great quality and an awesome value. I got a little excited and ordered more on my next order so I have them under my sink and well also. Excellent bus tub. One of the highest grade plastics available on the market, and surprisingly thick too, for the weight of it. Would recommend to a friend. The 20" x 15" x 5" Black Polyethylene Plastic Bus Tub, Bus Box definitely exceeded my expectations. it is perfect for toy storage and works well on my shelving that I had purchased at Webstaurantstore. The quality is excellent as it is very heavy duty and I highly recommend. Love this tub for storage of items in the walk-in or even in dry storage to keep items organized and out of original containers. Keeps things looking clean and can be washed and used lots. I like this size for the residents water glasses that they get fill with ice & water for all meals. The have stood up very good so far. 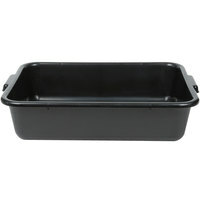 This sturdy black plastic bus tub is great for any bar or restaurant. Strong side handles and deep bin make this great for large loads. Strongly made buss tub that shows no signs of weakness at all. Really nice and for the price it cannot be beat. Grab a few. I use the bus tubs to transport food to/from events at my church. They work exceptionally well to haul 9x13 stacked or gallons of tea. Not how you'd expect these tubs to be used. But they work wonderfully well!!!! We haven't had any problems with these durable bus tubs after ten years! No cracking or warping. Very strong to carry as much as you can fit into it! Great durable hard plastic bus tubs. I purchased six of these about 3 years ago and still using them today. Great price for them too. These bins are going to come in handy. I like to keep things organized so this bin is just perfect for that. I have a lot of sorting to do, and I am pretty sure I will need many more of these! Nice quality bus tub for restaurants, bars or home use. Black plastic is sturdy and great for carrying heavy loads of dishes. 5" depth is ideal for most applications but there are other sizes available. Exactly what I needed and was looking for at a fair price! I will be stocking up on this item. Not your average bus tub. Nice job, guys! These are the best Bus Tubs for so many uses...I have used them for drain tubs with hydroponics, for storage and for my daughters wedding made a huge Greek Pasta Salad and carried to the banquet easily and served up excellent. Once you have these around you will use them in so many ways...excellent product, arrived promptly and highly recommend! Sturdy but lightweight enough to not add any extra bulk to the lifting! I've had three of these for over five years and the handles have yet to break off. Very classic design. Not as tall as I was expecting but overall good quality bus tub. I would suggest actually checking the measurements of the one you need. For the price of these they can't be beat hold up very well can't say the same for the lids as we've broken a few but we're very rough! Perfect tubs for collecting dirty dishes. We ordered extra so that we could replace them as needed, but never actually had to do so because they are so sturdy. Nice bus box. Perfect size for crew to bust down tables and get them cleared off. Great price on this large tub and shipped fast. I really like this tub because it isn't too deep. The black is also nice because it sort of hides what you're dumping into it. I've used some for ice, for shaker dumps, for almost any garbage. Washes great and easy to stack. I use this for my refrigeration work, catch the cleaner for coil cleaning. It gets thrown around in my truck, but holds up very well. Highly recommend! THIS BUS BOX IS VERY STURDY AND DOESN'T HOLD STAINS. ITS EASY TO WASH AND EASY TO CARRY. FITS ON THE BUS CART PERFECTLY. THESE HAVE BEEN A BIG HELP. This plastic bus tub is made with a very thick and durable plastic. Much thicker than expected. Excellent product and very good value, commercial quality. Excellent choice for restaurants. It is shallow than a typical bus tub but still is valuable. It holds plenty of dishes, glasses, and other dining room items. These were exactly as describe and held a good amount of dishes. We got multiple so we could switch them out when one got full. They were great for keep the dishes together and not having a mess of dishes. This little tub does a great job and is sturdy enough to carry quite a bit of weight. The price is great for what you get with this tub. I use these bins for everything! Cake supply storage. I hold it on my lap with a tiered cake inside while my husband drives me to a cake delivery. And we use them in the kitchen to gather dirty dishes that need to be washed. Easy to wash and store. Durable tote makes bussing a Mitch easier job. Handles on side are easy to hold onto. Also works great for food storage in the cooler! Great size for toting coffee cups around our church! We love that they're thick without being heavy, hold up under a lot of weight without cracking, and have an optional lid, which helps us store our serving items each week. This is a good quality tub that does its humble job. Of course, the price is definitely right. The plastic has enough flexibility to keep it from cracking easily, but enough strength to hold a full load of dishes. Good quality bus tub with tons of different uses. Very sturdy, good quality, and easy to clean. It is nice and short so it fits in a refrigerator very easily as well. Perfect size for transporting dirty dishes, while not being so large that it is unwieldily or too heavy for my students to transport. Black color helps to hide stains. Study construction. Overall a good buy. We use these for multiple things around the restaurant. We use them as bus tubs, storage bins, food prep and even food storage in our walk-in. I've used these all the time in the hospitality industry but thought they might be handy at home. They are. I use them to store canned goods in. I use them in my chicken coop and I use them as a nice big strong kitty litter box. You can't beat the price and the uses are endless. These bus tubs are awful. They are extremely flimsy and break after 2 uses. Unless you're carting around weightless napkins, do yourself a favor and buy something more sturdy. Bought two if this and very pleased with them. Used them in my catering job to transport utensils and used it at the end also to carry my dirty plates. Very strong and it did the job perfectly. Very please with them. The plastic bus tub is a lightweight and portable tray. It is suitable for busing dishes and glasses as well are larger items such as small pots and pans. These work very well at containing the mess, I would suggest ordering these with other items because the shipping can be high. Overall, i would buy these again. These black plastic bus tubs work great for storing dirty dishes in the middle of a rush. They help contain the mess until you are ready to tackle it. These tubs are great. As far as sturdiness goes they are medium in my opinion. They are obviously not as rigid as the clear plastic bus tubs, those are solid and do not bend. But these are nowhere as flimsy as rubbermaid tubs. We had a rubbermaid tub handle break off while carrying dishes, all our non commercial dishes in the tub broke into pieces. These tubs we have not had any issue out of though. They are sturdy enough for normal use. Short of putting this in an oven you will not hurt it. This plastic can handle freezing temperatures as well as boiling hot temperatures, all while being food safe. We use these for our ground sausage and ground cheese. It makes it so much easier up on the pizza make line - we were using sheet trays and would have to constantly run to the back to get more. These are great bus trays at a great price! I like ours because they fit in these sort of crate/rolling cart things we use. What else can I say about them? They do exactly what they're supposed to. The clean well, no gross little nooks & crannies to collect nasty-ness. Multi-use tubs. Not only are they sturdy, and of great quality, they can be used in many different ways. We recently used them to hold large gallon zip/freezer bags of cut veggies, they fit perfectly into our large refrigerator and made it easy to pull the entire bin out and easily view/find items. LOVE THEM! nice bus tubs...they are a little shallow for some applications, but still hold a nice amount of cookie dough, cereal...etc. Our bakers love these things. Very durable item. Anyone who has a use for a bus tub should consider using this item. Very inexpensive but well made product. Thank you for such wonderful products. We use this tub for allowing our dishes to dry, its very durable and serves multiple purposes, this is a must for busy places and quick cleanups. Very durable item. We use them to store durable equipment in for transportation. I would recommend the lids for them as well. May be purchasing more. I can't say anything bad about these, they tak abuse really well, they hold dishes and they get the job done. Simple and easy to use. This is a very durable and we'll made tub. I use them for making sausage and grinding meat. I like that they nest inside each other for storage. These are extremely durable and we are very, very pleased with them as well as the covers that we ordered to fit them. They are so much heavier than any reguar totes on the market. They are in as good shap today as they were when we first stated using them a year ago. I love these plastic bus tubs! I use them with ice to help serve fresh cut fruit in containers. Then I can use them to clean everything up in a jiffy! Great size and the black looks great all the time. They stack nice and hold lots of dishes. Not too heavy on its own like some bins I have used. This bin is reasonably sturdy and should be a help for storage and lugging various items. I actually got this with the hopes of using it in the business to transport bar soap. Not sure that will be possible due to the large ridges in the bottom. I'd expected a flat bottom. Basic bus bin, a little shallower than what we needed. We use this as a backup and to take to tables to bus and keep the deeper bus bin at our bus station. Very sturdy bus tub (can hold lots of weight without flexing). Matching lid available. Can be used for many different applications besides as a bus tub. This bus tub is a very economical bus tub. I would not purchase this planning on loading it with heavy plates, etc. I use it for soaking our silverware and it works just fine for a very low cost. These tubs come in so handy, great quality and good price! We use them in the kitchen to organize the shelves and they look great! I love using these bus tubs to store big batches of bread dough that I am letting rise. They are also good for many more tasks, such as stacking dirty dishes. The shallowness is convenient for prepping and it keeps our bartenders from over filling their buckets. Making salads in it is nice because we can have this on a high table and still cook.